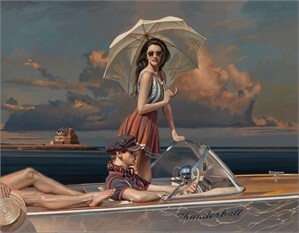 Peregrine Heathcote’s paintings conjure a world of intoxicating glamour and intrigue, slipping across the boundaries of time to fuse iconic pre-war design with modern conceptions of beauty and silverscreen-era romance. The images could depict a dream world—the pure artistic vision of a painter fascinated with the bygone glamour of his parents’ youth and his own childhood spent in Britain and Dubai, but also by the contemporary incarnation of glamour in an international jet-set culture. The images could be literal representations of actors on movie sets, or real-life models letting their contemporary sensibilities peek through as they pose against period backdrops. Each canvas suggests a story, prompting us to imagine the circumstances around a single crucial scene. Heathcote purposefully leaves such questions open, allowing us room to construct multiple narratives. This weaving in and out of various realities, blending the literal and metaphoric is achieved with great skill, imagination, and ingenuity. Peregrine Heathcote was born in London in 1973. His natural talent surfaced at the age of 12 attending classes at the Heatherly School of Art in Chelsea. He then went on to Stoneyhurst and Harrow where he completed his formal education. Heathcote then began his classical training in Italy graduating from the Florence Fine Art Academy in 1994 and began his professional career as a working artist in 1995. Since commencing a professional career as a portrait artist in 1995, Peregrine Heathcote has completed over 100 commissions including Prince Jeffrey of Brunei, the Duke and Duchess of St Albans, The Earl of Bradford, The Countess of Effingham and Lord Selsdon. His virtuoso and classical style of painting has also led to commissions from many notable captains of industry and commerce as well as celebrities in the world of film, theatre and television.